Fidel Castro, the fiery apostle of revolution who brought the Cold War to the Western Hemisphere in 1959 and then defied the United States for nearly half a century as Cuba’s maximum leader, bedeviling 11 American presidents and briefly pushing the world to the brink of nuclear war, died Friday. Last I looked, Cuba was a sovereign nation not under U.S. control, so what can it possibly mean for the leader of that nation to "defy" the U.S., unless of course one assumes that a sovereign nation close to the U.S. must do the bidding of the U.S. as it had done under the fascist Batista. Even more remarkably, it is Castro whose agency is credited with bringing "the world to the brink of nuclear war," not the "best and the brightest" of the imperial power whose self-serving provocations actually created the crisis. If Castro had been a student of Marx, he would, shortly after overthrowing the fascist Batista, have created a social democracy, with robust private markets to fuel the development of productive forces in his underdeveloped nation and combined that with a generous welfare state to promote and protect human well-being. He tried to do the latter, but could only sustain it with support from the Soviet Union (since the U.S. economic blockade deprived Cuba of it primary trading partner), which ended when the latter did. As Marx had observed, communism "presuppose[s] a great increase in productive power, a high degree of development," which only capitalism can produce; this is, he said, "an absolutely necessary practical premise because without it want is merely made general, and with destitution the struggle for necessities and all the old filthy business would necessarily be reproduced," as, indeed, it was tragically in "communist" Cuba. The NYT obit doesn’t mention what was likely Castro’s greatest achievement- the important role played by the Cubans in the demise of apartheid. Cuban military action, which included battles with the South African Defense Force, prevented the apartheid regime from maintaining a cordon sanitaire around South Africa. This was a major factor in the De Klerk regime’s decision to seek some kind of accommodation. 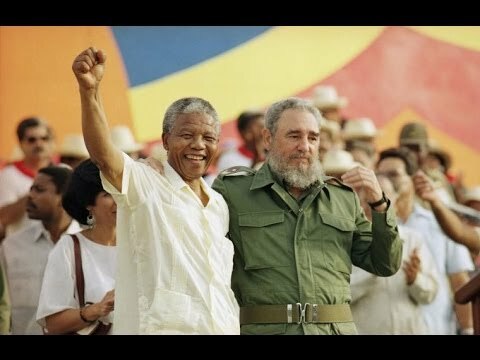 Since our lazy media are committed to the facile view of the end of apartheid as an example of non-violent change, this will not be mentioned in any descriptions of Castro’s life. Mandela knew better. Shortly after his release from prison, he visited Havana to express gratitude to Castro.